(Photo: REUTERS / Christian Veron)The National Guard troops advance after anti-government protesters set fire to the housing ministry in Caracas April 1, 2014. Venezuelan troops dispersed opposition demonstrators with tear gas on Tuesday and blocked anti-government activist Maria Corina Machado, recently stripped of her seat in the National Assembly, from reaching the legislature. CARACAS (Reuters) - Venezuela's Roman Catholic Church accused President Nicolas Maduro's government on Wednesday of "totalitarian" tendencies and "brutal repression" of demonstrators during two months of political unrest that has killed several dozen people. The surprisingly strong attack is likely to revive church-state tensions that were constant during the 14-year socialist rule of Maduro's predecessor, Hugo Chavez. Monsignor Diego Padron, who heads Venezuela's conference of bishops, said the "principal cause" of the crisis was the government's attempt to implant a blueprint for government that Chavez left behind called "the fatherland plan." "Within it they are hiding the promotion of a totalitarian-style system of government, putting in doubt its democratic credentials," he said, reading a church communique. Though defending students' and others' right to protest, the Church condemned both the demonstrators' tactic of barricading roads and the state's "brutal repression" of dissidence. Protesters have been on the streets since early February calling for Maduro's resignation and complaining about a litany of problems from rampant crime to food shortages. The government says they are seeking a coup against Maduro. Chavez for years painted Venezuela's Catholic hierarchy as being in league with his foes among the nation's political elite, and was furious at their endorsement of a brief-lived coup against him. Chavez died last year. Until Wednesday, Venezuela's church had kept a relatively low profile over the recent unrest, and both sides had been mooting the possibility of mediation by a Vatican official. 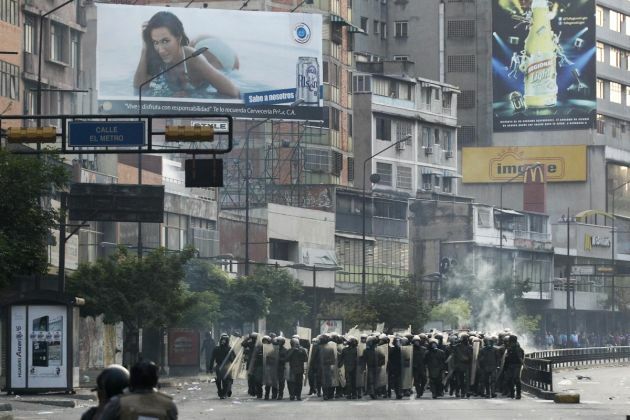 The 39 fatalities have included government supporters, protesters and members of security forces. Maduro says opposition media, international media, rights groups and the United States are trying to concoct an impression of state repression to put pressure on him. "The government is wrong to want to solve the crisis by force," the Church statement added. "The solution is clear: sincere dialogue between the government and all sectors."